The word “wine” conjures up a world rich in history, tradition, culture and sentiment. It is a drink which has “accompanied” man for centuries, since the advent of the first agricultural civilizations. Wine making from grapes is a natural process. Differently, for the fermentation of fruit wines we need to add sugar. In fact from the second millennium B.C. to not so long ago, there haven’t been any big changes in cultivation and wine making. Today in Italy we still call some grape farming methods “Greek” or “Etrurian”. Most historians, archaeologists, linguists and botanists agree that wine was “invented” somewhere south of Caucasus and north of what we now call Iraq. Old historians tell us about wine transports along Euphrates River, from Armenia to the rich city of Babylon. In the Biblical Book of Genesis, after the Great Flood, Noah begins anew by planting a vineyard and making wine. He is credited as being the first to plant a vineyard. 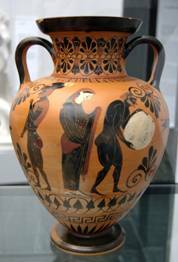 In the West, the history of wine is linked to Greece. 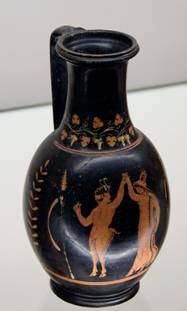 In fact, wine came probably to Europe with the spread of the Greek civilization a bit less than 3,000 years ago. Homer’s Odyssey and Iliad both contain excellent and detailed descriptions of wine. The Greeks also learned to add herbs and spices to mask spoilage. Wine was consumed in Greece at breakfast or at symposia. The Greeks from Sicily (so called Sikeliotes) invented an ability game, the Kottabos that was played during symposia. 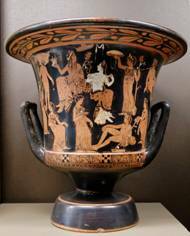 Ancient Greek religion had a god of wine, whose name was Dionysus. In ancient Rome, the same god had early the name Bacchus, then Liber. So wine arrived in Italy, called Enotria, land of wine, by the Greeks, and from here it reached every corner of Europe. So wine making became so common that a Roman emperor, Domitian, in 92 A.D. enacted a decree that orders to extirpate 50 % of vineyards outside Italy and the prohibition to plant new ones in Italy. As we can see European Community did not invent anything really new! Today wine is a drink whose consumption is increasing day by day (world wide production is about 26 million tonnes), reaching new followers outside Europe, is a product with a relevant economical interest and a sector where different people are working, such as farmers, agronomists, winemakers, architects, journalists, organizers of fairs and contests and, at the same time, is a social and cultural topic. One could reasonably conclude that Wine is Culture. In our opinion, there is some exaggeration on this and other similar topics and we believe that a good wine can be enjoyed with any glass. Having said that, it should be noted that not all glasses are right for appreciating good wine, and different types and styles of wine are best drunk with a certain type of glass, even though the quality of the contents is more important that the quality of the container. The tulip-shaped glass is advisable for young white wines. For red wines we have to make a distinction: for the young ones we will use a chalice of different sizes, while for the aged ones we prefer a so called balloon glass. Only one indication is mandatory: the glass must be made of glass or crystal, transparent and odorless. Transparent because two of the elements to “taste” are color and density of the wine and one can do it with a transparent glass only; odorless for obvious reasons, if you want to “feel” the scents of wine, no other smell must interfere. For red wines it is also necessary treat with caution “room temperature”, as in fact “room temperature” refers to the ideal temperature of a perfect wine cellar. Therefore one should not be ashamed of putting his/her bottle of red wine in an ice bucket in summer, in order to lower the temperature from the 30 degrees (86 °F) of actual room temperature (in essence the external temperature) to the 18 degrees (64 °F) at which the wine should be served, and sometimes this is even lower for less full-bodied wines.